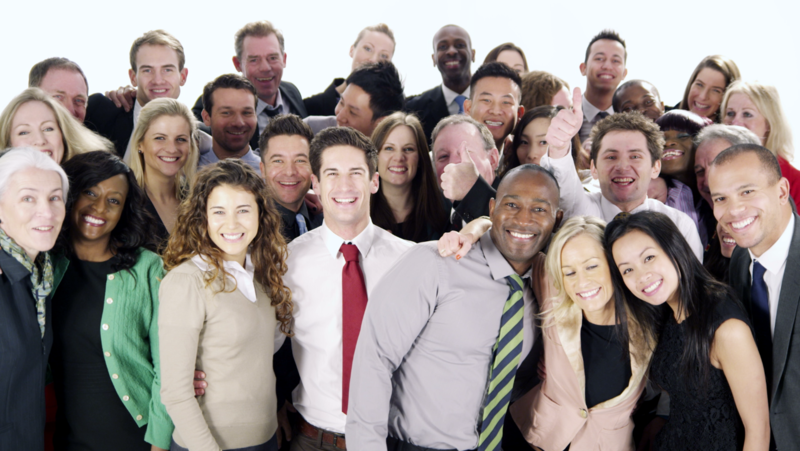 Unleash the power of personal referrals to grow your business. Manage, track, and build your network like never before. PromotingPays.com enables merchants to share their unique offers, and unleash a powerful army of promoters who will share these deals with their personal networks. For Promoters it couldn’t be simpler to find offers and utilize social media, text, print, or email to spread the word, getting paid for sales that result! Free program. No cost to promoters. Ever..
What is the difference between a Promoter and a Merchant? Can I be both a Promoter and a Merchant? Absolutely! Many of our Promoters are Merchants that also want more referrals for their business. Anyone can be a Promoter. As long as you know someone who wants a great deal on products and services, and you would like to earn money when you refer a sale – you should be a Promoter! Do I need to have a business to be a Promoter? No, you do not. You can sign up as a business or an individual. Just click Sign Up on the top of the page. Give us some information, review and agree to the terms and conditions, and you’re on your way. You can start promoting and earning today! I just created a Promoter account and would like to start. Now what do I do? Once your account is active, you will login to access all of the great promoting tools that have been created to help you become a successful Promoter! You will have access to flyers, emails, social media templates and contact imports to use when notifying your contacts of all the great offers/brands we have available. What are the costs involved in being a Promoter? No. Cost. Ever. Promoters never pay, they only earn! It is free to sign up and to participate in the program. 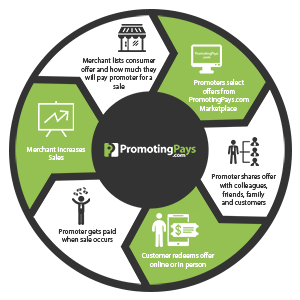 Each time you share an offer via PromotingPays.com, it will contain a unique Promo Code and in most cases, a bar code. Whenever one of your contacts makes a purchase from a Merchant, they will record that Promo Code and the sale will be linked to you. Will I be made aware of new offers when they are available? Yes, you will be notified by email on a weekly basis of new offers that are available. Also, each time you log into your account, you can click on “Find New Offers” and view additional offers you would like to join. Payments are made via PayPal. You will receive an email letting you know that your payment has been sent. Do I need to have a PayPal account to get started with PromotingPays.com? No. Not to get started. Once you have earned commissions, you will be notified and can set up the account at that time. I don’t have a PayPal account. How will I get paid? Once you have earned commissions, you will get an email letting you know that you have a payment waiting. If you don’t already have a PayPal account associated with your email address used for your PromotingPays.com account, the email message will contain a link that directs you to a PayPal signup page. The signup process automatically confirms your email address. When you complete the signup process, the money will be available in your new PayPal account. I already have a PayPal account, how will you know where to send my commission? As long as your PayPal account is associated with the email address you registered on PromotingPays.com with– payments will automatically go to your PayPal account. The notification will include a link to your PayPal account to access the funds. If you have a PayPal account, but the email address you registered on PromotingPays.com is different – you will be offered an opportunity to log in to your account. Then, when you log in, the money is deposited to your account and the new email address is added to your account automatically. 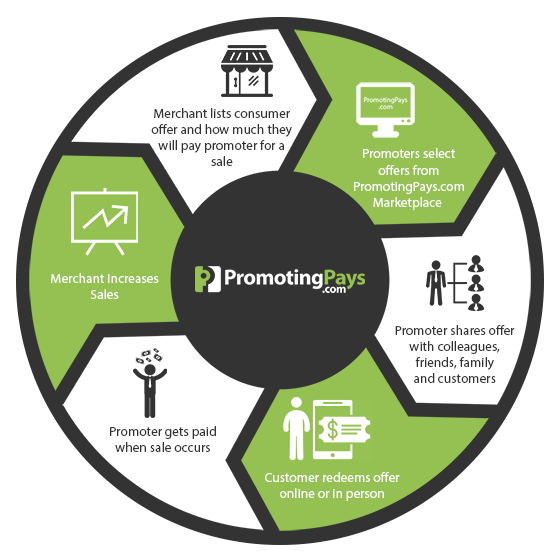 PromotingPays is an online platform, which enables Merchants to share unique offers with tens of thousands of Promoters in our network who will promote these deals to their personal contacts. You can track all the referral activity via our easy to use reporting tools. How much does it cost to be a Merchant? PromotingPays.com is free to participate. There is no risk and no obligation- you only pay when you get a sale referred by a Promoter. You decide how much you would like to pay the Promoters for each sale. We take care of all the rest. When you let us know that the sale is complete, you will submit payment through PayPal for the amount you offered to pay per sale, and then we send payments to the Promoter that referred the sale. We handle all of the customer service for the Promoter – so that you can just focus on what you do best, running your business. What kind of marketing materials do Merchants need? PromotingPays.com has all the tools to let you create materials that the Promoter will need to share your offer. Just upload your company logo, tell us about your business, describe the customer offer, and enter how much you will pay for a sale. Our powerful yet easy to use tools will help you create Flyers, Landing Pages, Social Links and even Email templates for your Promoters to use. How do I accept or track referrals from Promoters? It’s easy – all you need to do is record the unique promo code that the customer will have on their offer they got from the Promoter. Just log into your Merchant account and click on Register a Lead/Sale. Enter the customer name, choose which offer they are redeeming (you can have multiple), and enter the referral code. We also have a Merchant app for both iPhone and Android that will let you use your camera as a bar code scanner to log the lead. How do I create a new offer? When you are ready to create a new offer, log into your account and click on the blue box “Add Offer” under the Offers section. You will enter basic information regarding the offer, including the commission amount. The next step will be to use the tools we provide to create a marketing flyer and email that Promoters can use to share this offer. Will I be able to communicate with the Promoters that are linked to my offers? Yes, you are able to send an email through our system to all of your active Promoters with any new information you would like to share, such as a new offer or information regarding your company that will assist them in promoting your business. How can I track the success of the program? What is “Register a Lead/Sale”? “Register a Lead/Sale” is where you will enter a new lead, appointment or sale. The information collected (customer name, offer name, referral code and sale amount) is used to track the lead and sales data for each Merchant. Promoters never pay a thing to participate. It is completely free to them. They get paid when a sale they referred is completed. How does PromotingPays.com make money? PromotingPays.com keeps 20% of the amount you pay per sale. So, if you are paying $50 per sale, the Promoter gets 80% or $40, PromotingPays.com gets 20% or $10. When you add an offer, we do this calculation for you, so you’ll see exactly how much the Promoter gets. Is there a minimum amount a Merchant can pay per sale? Nope. You decide. You can pay as little or as much as you want. However, we have found that Promoters will work hardest to promote the offers that pay at least $25 per sale.